Three – Two – One …Blast off! With two very exciting launches scheduled for this Spring, scientists are getting ready to learn more about our own and other planetary systems. TESS orbiter is scheduled to take off on April 16, 2018 and the InSight lander might start its space journey as early as May 5, 2018. 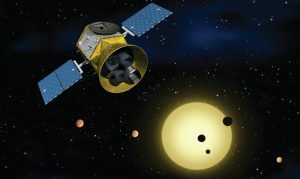 TESS stands for Transiting Exoplanet Survey Satellite. It started over a decade ago as a small privately funded project. In 2013 NASA picked TESS to become a part of their Explorers program. The satellite is going to look for exoplanets, that is planets orbiting stars other than the Sun. It will observe over 200 000 stars over the planned two year program. Since the discovery of the first exoplanet in 1992, Astronomers found thousands of planet-like objects. Nearly 4 000 of them were confirmed as exoplanets. Most of those exoplanets were detected by transit photometry, i.e. by looking for a small periodical dip in a star’s brightness. By now we’ve checked some parts of the sky for transiting planets. But the new mission will provide a full-sky scan, with its four cameras staring at the sky and mapping locations of Northern Hemisphere exoplanets in the first year and Southern Hemisphere exoplanets in the following year. The most interesting objects from TESS catalog will be later studied by other space missions, including James Webb telescope, as well as ground based instruments. The mission was first scheduled to launch in 2016, but due to instrumental problems the launch was postponed. InSight stands for Interior Exploration using Seismic Investigations, Geodesy and Heat Transport. It is a first-of-a-kind Mars lander that will study the Red Planet’s geology. 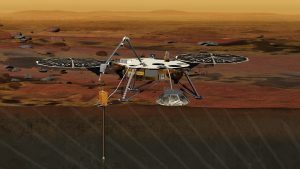 InSight will carry several cameras, a seismograph to study marsquakes, a heat probe to measure how heat travels from the planet’s core to the surface and a few other instruments. The robot will also have a microchip on board with names of 2.4 million members of public, including those of our mobile planetarium team. We cannot wait to touch-down on Mars! What is so special about InSight? Scientists suspect that marsquakes shake the insides of the planet every now and then. The quakes on Mars are probably different from earthquakes. But what exactly causes them we are yet to find out! Do the tectonic plates on Mars move? Are there still active volcanoes? We’ll see! InSight will also listen to the sound of meteorites bombarding the martian surface. By studying how waves travel underground through different layers of Mars, we hope to learn more about the insides of the Red Planet. So what does Mars look like inside? Why did Mars and Earth formed at the same time, out of the same elements, but are so very different? And finally…How do rocky planets form? These are the questions we are hoping to get the answers to with the help of our InSight robot. The MarsQuake is an educational project that will provide brilliant classroom activities and resources for secondary school learners. It will be using real data and pictures from the InSight lander!